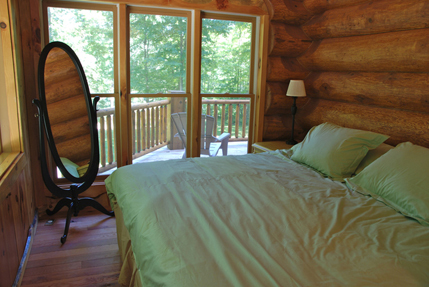 or Private Bookings at anytime for trout, steelhead, smallmouth or salmon- on the Muskegon River in Michigan! Walk right out the back of the lodge and onto the guide's boat! These trips are limited to 4 anglers only!!! Please let us know if you have any questions whatsoever. 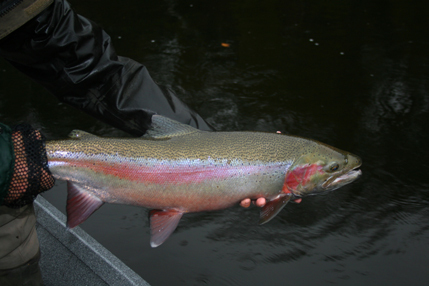 We have been outfitting folks for Michigan Steelhead fishing for nearly 30 years now and will be happy to help! Mad River Outfitters is proud to represent the Muskegon River Lodge and RiverQuest Charters. This is one of the nicest facilities of it's kind in the East. Your expectations will be exceeded! 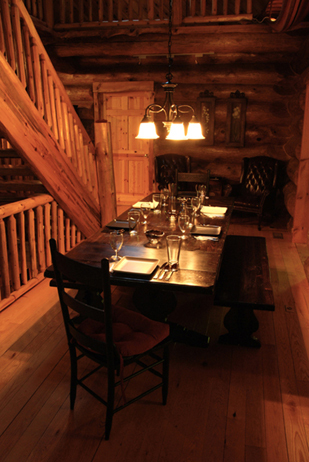 The Muskegon River Lodge is an extraordinary property, which we have found perfect for our Muskegon River adventures! 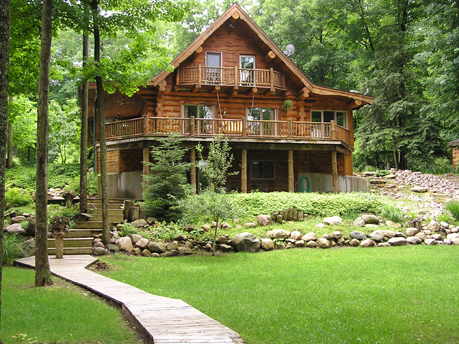 Secluded on 12.5 acres with 400 feet of prime Muskegon River frontage. 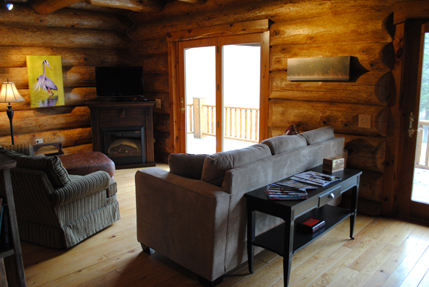 With it's full western log construction, planked flooring, tongue and groove ceilings, the Muskegon River Lodge evokes a welcoming warmth- perfect after a day of Steelheading with Mad River Outfitters! Can't make our hosted dates? Let Mad River Outfitters put together a trip package for you and your friends or family! The Muskegon River- secluded, yet close - is located 45 minutes north of Grand Rapids, Michigan in Newaygo, Michigan. The Muskegon River banks are anchored by deep forests and its clear water courses over gravel bars into deep, dark runs and pools. 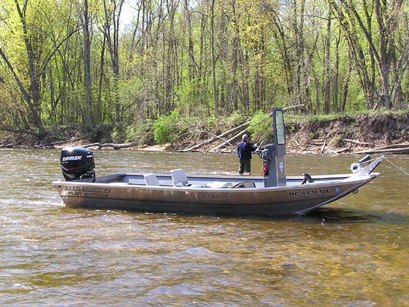 With miles of its wide, expansive river to explore, our Muskegon River fly fishing guides put their clients into locations proven to hold fish by years of experience and knowledge of catches of the previous day. Our jet-powered boats enable our guides to move up and down the river at will, increasing opportunities for hook-ups. 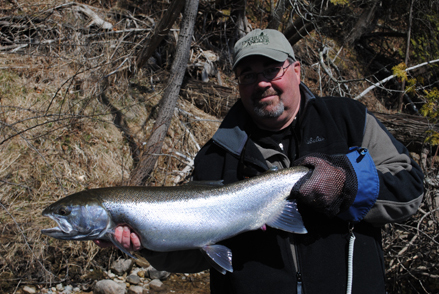 March and April are prime months for steelhead in Michigan. These mighty fish are capable of extended runs and spectacular acrobatics at this time of year. 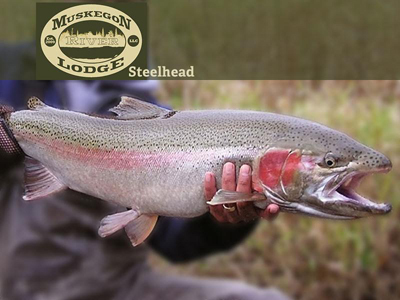 The Muskegon River offers some of the finest fly fishing oportunities for steelhead to be found in the U.S......and we'd like to put you right in the middle of it!!! 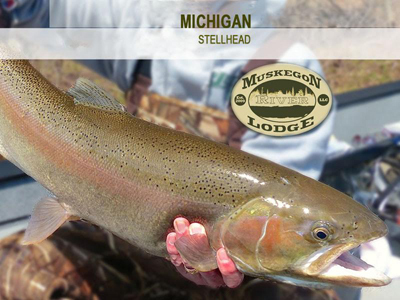 For these trips at the Muskegon River Lodge we will be using Steve Kuieck and his staff of guides. The RiverQuest Charters guides are above all, lovers of fly fishing and gracious, enjoyable hosts. As a matter of fact, you will often find them on the river on their days off... fly fishing. They love to teach, and that is why they count it a special privilege to introduce people of any age, and with no prior fly fishing experience, to one of the great sports... their sport. 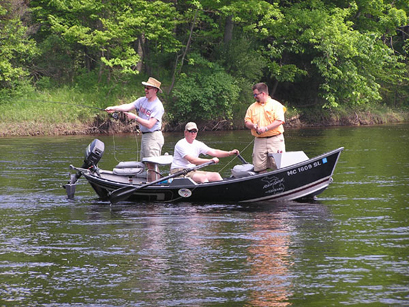 For the more accomplished fly fisherman or fisherwoman, our Muskegon River fly fishing guides respect your knowledge and skills and will accordingly give you plenty of space to cast and fly fish in the manner to which you are accustomed. Although our guides seek to give all their clients something new to experience, they learn much about fly fishing, life, and the fish they pursue from their valued clients and friends. To book our hosted trips or to arrange a private/custom booking - give us a call at 614-451-0363 or send us an e-mail at [email protected]. We'll get you set up. You can also now book these trips ONLINE! Give us a call at 614-451-0363 or drop us an e-mail at [email protected]. We'll be happy to help!